This building was constructed around 1865 for Theodore Prentiss, a pioneer attorney in Watertown. Prentiss was a Yankee who came to Watertown in 1845. 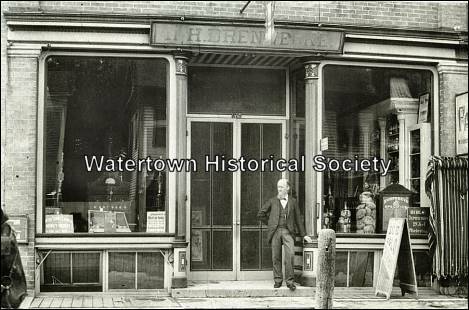 He was Watertown's first mayor after the city was incorporated in 1853. He also attended the first two state constitutional conventions in 1846 and 1847, and was an assemblyman between 1860-61. Prentiss had his office here during much of his illustrious career. This building also housed some retail firms. It was the Brennecke and Steinfort drug store between 1880 and 1885, the Robert Brennecke drug store between 1889 and 1911, and the William Gehrke drug store between 1915 and 1930. NW Univ of Chicago, graduation certif. WI State Board of Pharmacy certif. c1886 Brennecke Pharmacy prescription ledger circa 1886. Ledger also includes names of several other pharmacists in Watertown. Watertown is prominently featured in the 1988 calendar published by The State Historical Society of Wisconsin. Called the "Wisconsin Historical Calendar," it represents photographs from the society's archives. They represent photos from the 1860s to the 1940s. Among the 57 photos published are several by Henry F. Bergmann of Watertown who was a pharmacist but had a sideline of postcard photography. Watertown pharmacist who had a sideline of postcard photography. 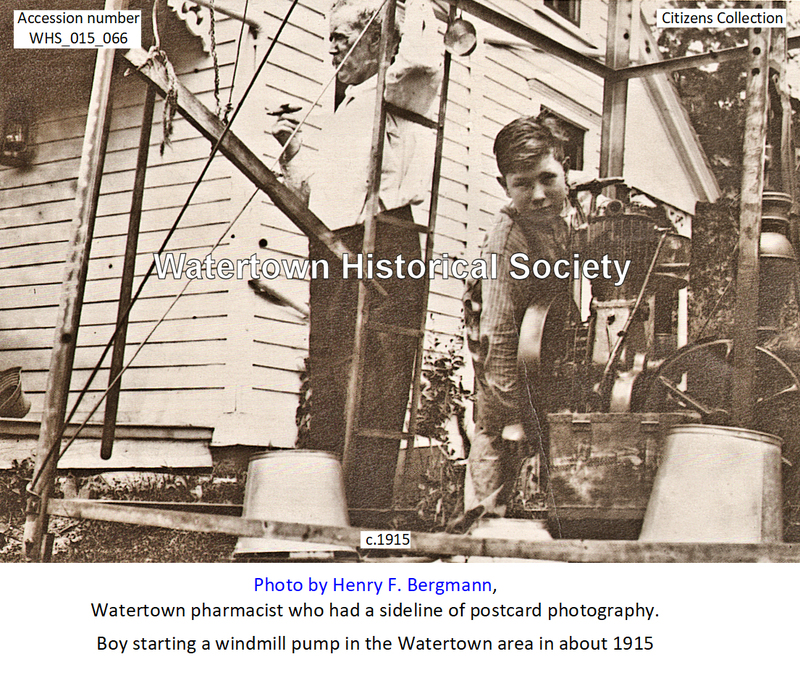 Other pictures by Bergmann show a boy starting a windmill pump in the Watertown area in about 1915, a wedding table in Watertown in about 1905, the back room of his pharmacy, a picture of his tour up the Hudson River in New York in 1901 and a retail display of Christmas ornaments in Watertown in about 1905. The calendar includes some brief information on Bergmann who is featured on several pages. It says he was born in Watertown in 1876. He began clerking in a Watertown drugstore in about 1895 and for most of his life operated pharmacies either in Watertown or South Milwaukee. He began taking photographs in the early 1890s, soon transforming his hobby into a sideline as a postcard photographer and taking pictures of parties, businesses, expositions and distant cities and points of interest. There are 600 of his plates in the state society archives and the South Milwaukee Historical Society also holds a substantial number of them. 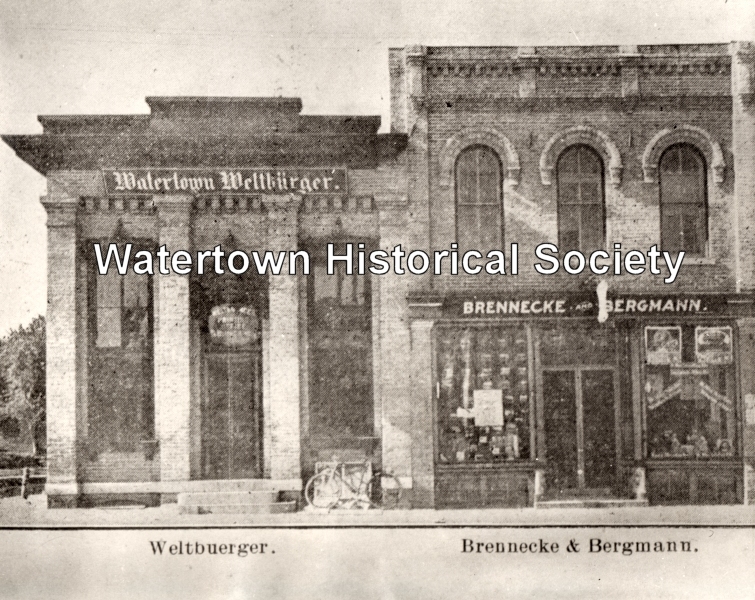 His pharmacy, the Brennecke and Bergmann Pharmacy, [near the intersection of] Fourth and Main streets, is now the location of Watertown Mutual Insurance. The pharmacy was operated by Jerry and Jeannine Mallach for many years and later by Mike and Katherine Chandler. 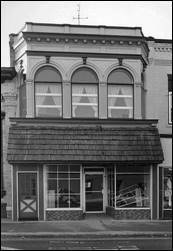 Gehrke purchased the Brennecke Drug Store in 1914 and operated it under his name until his retirement in 1953, when he sold the business to Jonas Mallach. The Gehrke Pharmacy at 315 Main Street, one of the oldest drug stores in Watertown, has changed ownership, following completion of the sale. The new owner is Jonas J. Mallach, 218 North Maple Street, who has been associated as a pharmacist in the store for many years. William Gehrke has operated the business since 1914 and will continue to work at the store, assisting the new owner, for the present at least. Gerald J. (Jerry) Mallach. A Watertown young man is one of 53 in Wisconsin who on Saturday were awarded certificates to practice pharmacy in Wisconsin. The list was announced in Milwaukee following an examination conducted by the State Board of Pharmacy. The Watertown man is Gerald J. (Jerry) Mallach, son of Mr. and Mrs. Jonas J. Mallach, 218 North Maple Street. Mr. Mallach owns and operates the Gehrke Drug Store, at 315 Main Street. His son is associated with him in the business. William Gehrke, 73, retired pharmacist who for many years operated the Gehrke Drug Store, died October 21, 1958. He was born in Watertown in 1884, attended Watertown Public Schools and graduated from the Northwestern Pharmaceutical School in Chicago. He was a life-long resident of the city. Burial was in Oak Hill Cemetery. 01 16 Gerald Mallach, 1007 South Ninth Street, was chosen as president of the Watertown Association of Commerce at a special meeting of the board of directors held this morning at the Elks Club. Mr. Mallach is associated with his father, Jonas, in the Mallach Pharmacy at 315 Main Street. He has been active in Watertown civic affairs for some time and was head of the United Fund drive for 1964, which made its quota for the first time in years. He succeeds Clifford Warren, who submitted his resignation due to the press of business. John Lietzow employed as pharmacist. The Mallach Pharmacy at 315 Main Street has completed a modernization project which includes a new and attractive front. 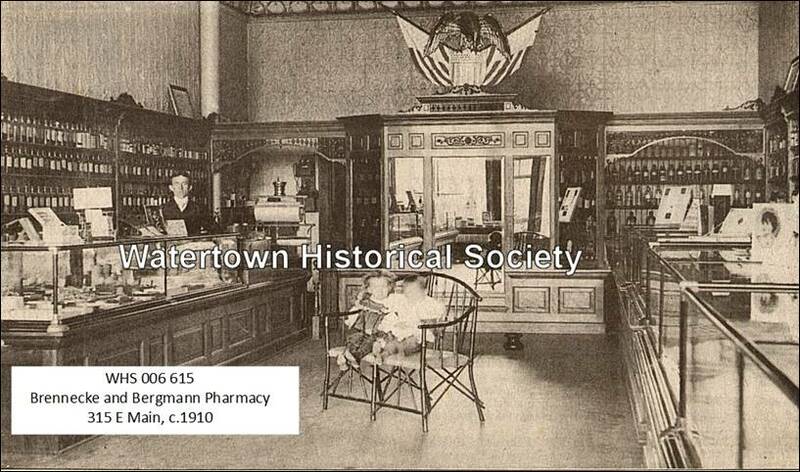 The pharmacy, one of the oldest continuous drug stores in the city, dates back well before the turn of the century. It was at one time the R. H. Brennecke Drug Store. Later it became the Gehrke Drug Store. The late William Gehrke went to work for Mr. Brennecke as a boy and took over the business in 1914, changing the name. In 1918 the late Jonas Mallach went to work for Mr. Gehrke and in 1953 took over the business from him. Gerald (Jerry) Mallach began working at the pharmacy under his father in 1954 and following his father’s death in November of 1956 took over the business which he now operates with his mother, Mrs. Jonas Mallach. Mallach's Pharmacy, 315 East Main Street, and Mallach's Clinic, 123 Hospital Drive, will be consolidated with Busse-Good Value Pharmacy as of Friday. Both Mallach drug stores will be closed and prescription records will be available at Busse's, 204 East Main Street. Inventory from the closed stores will also be moved to Busse’s. With the sale, one of Watertown's oldest businesses will disappear from the location it has occupied for the past 115 years. The downtown pharmacy, believed to be one of the oldest in the state, has been continuously operated under various owners for over a century. Mallach's owner Michael Chandler said he decided to sell the stores because of health reasons. He will continue to own and operate Juneau Pharmacy in Juneau and will also continue to do nursing home consulting. A native of Independence, Iowa, Chandler graduated from University of Wisconsin-Madison School of Pharmacy in 1968. He and his wife, Kathie, moved to Watertown in 1973 from Waukesha where he was a vice president for Stein-Walgreen drug stores. They entered into partnership with Gerald Mallach for the Mallach pharmacies in 1974 and became sole owner in 1977. Mrs. Chandler also worked at the drug stores, serving as bookkeeper among other duties. Mallach's downtown store was operated for many years by Jonas Mallach and then his son, Gerald Mallach. Previous owners also included R. H. Brenneeke and William Gehrke. The building where the drug store is located will continue to be owned by Gerald Mallach. There are no new plans for the store at this time. On Dec. 1, 1982, Chandlers purchased Juneau Pharmacy which had been owned by Ralph Heacox of Juneau. They will continue to reside in the town of Watertown at W6818 Silver Creek Road with their three sons, John, 22, Daniel, 19, and David, 14. Busse's is owned by Al Shumaker and William Devine. The pharmacy is part of Pharmacy Consultants, the largest independent pharmaceutical buying group in the state. Busse Pharmacy merged with Union Prescription Center and became Busse-Good Value Pharmacy on Nov. 1, 1984. Shumaker has been a pharmacist at Busse's since 1967 and has operated the drug store since 1976. He is a 1967 graduate of the University of Wisconsin-Madison School of Pharmacy. He and his wife, Mary, reside at 611 Clyman Street with their three daughters, Kim, Patti and Ellen. Michael Chandler of Watertown was called to eternal peace on Friday, Sept. 17, 2010, after a long battle with heart and lung disease. Michael was born in Quasqueton, Iowa, son of Erma and Jasper Chandler on March 21, 1942. He graduated from Independence High School, Independence, Iowa, in 1959. From there he attended Northwest Institute of Medical Technology, Minneapolis, Minn., with high honors in 1960. It was there that he met his wife, Katherine Stark. They were married on April 28, 1962, at St. Mary's Catholic Church in Palmyra. Both Mike and Katherine worked at Wood Veterans Hospital in West Allis. He later started pharmacy school at UWM 1963. After two years he switched to University of Wisconsin-Madison where he also worked at St. Mary's Hospital. He graduated from UW-Madison in 1968. He was employed at Stein Walgreen rising to the position of vice president. 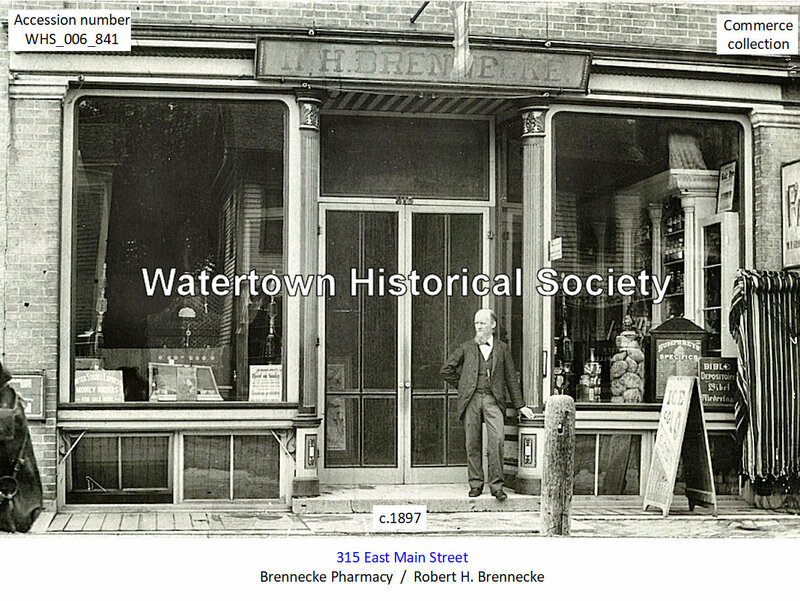 1973 Mike and his family moved to Watertown to work at Mallach Pharmacy later purchasing the business. Mike later obtained Juneau Pharmacy in Juneau. Mike loved golf, playing cards, traveling and spending time with his family. He was on the board of directors of the Watertown Food Pantry, Watertown Country Club, St. Bernard's Parish Council, and was a past president of the Watertown Lion's Club. He was a member of Watertown Country Club for 37 years . . .
Gerald J. Mallach, 81, of Watertown, passed away on Friday, Sept. 6, 2013. Gerald was born on June 2, 1932, to Jonas Mallach and Edna (Schultz) Mallach. After graduating from Watertown High School in 1949, he went on to study pharmacy at Drake University in Des Moines, Iowa. On June 19, 1954, he married Jeannine Krebs. From 1956-58, he served in the U.S. Army with Jeannine at the Dugway Proving Grounds outside of Salt Lake City, Utah. Gerald was best known as the owner of Mallach’s Pharmacy, initially joining his father’s business as an intern and becoming the sole proprietor in 1965. Later in life, he established a second career as a counselor, working at several area hospitals and private facilities before accepting a position as a counselor at Jefferson County Human Services. Gerald fostered a deep and lasting commitment to the Watertown community. He helped to revive the chamber of commerce and was a longtime member of the Rotary Club, served as the president of the Watertown Historical Society, the Lions Club and Easter Seals and held many positions at the First Congregational United Church of Christ. Those who knew him will remember his sense of humor, compassion, ethics, generosity and enduring optimism. He is survived by his wife of 59 years, Jeannine; his son, Jeff of Hartland and his wife, Lynn, and daughters Amy Eckert of Watertown and Sarah Buss of Janesville. Gerald’s five grandchildren, Jessica Mallach (Pangborn), Quincy Eckert, Savannah Buss, Steven Buss and Cameron Eckert, and three great-grandchildren, Mason, Broderick and Adelyn Pangborn, will all miss him dearly. A memorial service will be held Saturday at 11 a.m. at the First Congregational United Church of Christ, 120 Kuckkan Lane, with the Rev. John Kennedy officiating. Visitation will be held at the church on Saturday from 9-11 a.m., followed by a luncheon. Memorial gifts to the First Congregational Church UCC or the Watertown Humane Society, 418 Water Tower Court, would be greatly appreciated.